I wanted to say thank you for all your kind words this week. It's still hard to believe that Angela is gone - but i know that she'll be with me my whole life. last Thursday i celebrated my birthday by taking myself out to see my friend Kathy's first solo art exhibit at a local gallery. Her show is called "Infinite Spaces" and it features her beautiful sculptures, the pictures really don't do them justice. Each one of these boxes had peep holes you could look inside, and see a magical whimsical world she created. a view inside "Infinite Sadness"
these key 'prints' make such a rad art piece. It may be one of my favourite from her show. It was so great to go and spend time at her show - Kathy has a very special place in my heart (and on this blog) because if it weren't for Kathy asking me if i'd ever heard of Zentangle before, this blog might not even exist!! On Friday my friend Jaimie asked me to go out with her to a Gem and Mineral trade show - she had won free tickets, so i said yes - because i love rocks and stones and gems. It was so fun and i loved everything. i probably could have spent many many dollars there, if money was no object. lol. Afterwards she suggested we go and get some supper, but then she said; "I have a great idea, let's go and get supper at Crackers, and have a few drinks and sing Karaoke!" I haven't been to Crackers Karaoke bar in YEARS, and said sure - that would be fun. on our way there, she suggested i text my friend Tara and see if she wanted to come too, but Tara said: "Mayyyybe" - and given that her husband was leaving the country the next morning for work, i figured she probably was busy and so i left it at that saying: "She knows where we're going, if she can make it, she will"
Like. I must be totally oblivious to everything. Because, it took me walking into the bar, and all the way to the back and literally STANDING in front of a table where my friends Tara and Jen were already waiting with birthday balloons and gifts to figure out that i had been Surprise Partied. and my friend Rae showed up as well!! 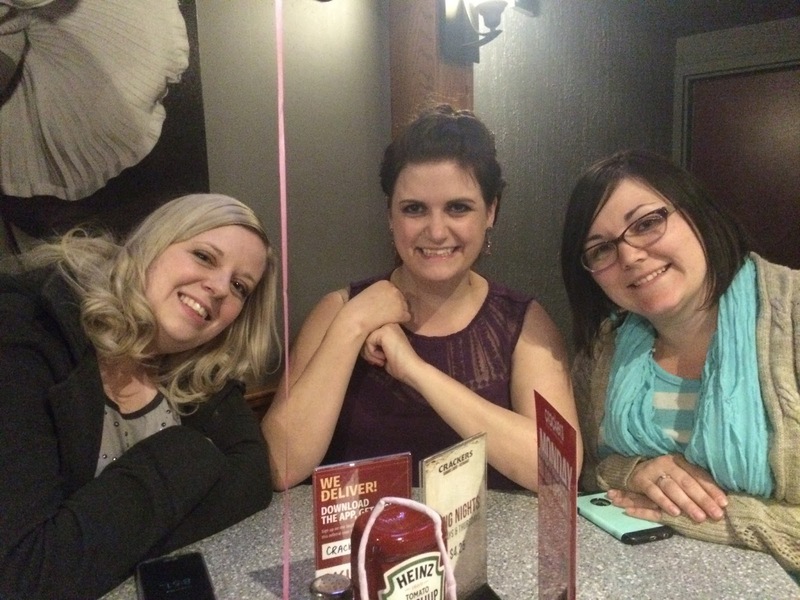 It was a surprise Karaoke party - and guess who was the mastermind behind the whole thing?? B-rad. I have to say, i'm a pretty lucky girl. We had so much fun - and i sang my Karaoke Jam - which is "All that Jazz"... and i killed it. and we sang Spice Girls, and Summer Lovin', and the girls got up and sang happy birthday to me and they brought out a cake from the kitchen - it was so awesome and i felt really and truly loved. A real pick me up from my slumps at the beginning of the week. I was really feeling down because of grief, and it did nothing but rain for 3 days, and my birthday was kinda ho-hum... i remember thinking that being a grown up is sucky cuz no one makes a big deal on birthdays anymore... but my friends made me feel very happy. by the weekend, the weather was nice again and i finally planted the rest of my flowers - you may remember this flowerbed from the fall - it looks so pretty full of flowers. It really makes me so happy. Such a nerd, i am. The boys have also been hilarious this weekend. B-rad and i have been talking about what kind of tattoo to get for our tenth anniversary (which was in 2014) and so Artoo said he wanted to have a tattoo of Rowlf the Dog. What? Dude. That would be some killer ink. Naturally, i obliged. Love me a Crayola Tatt. What a badass, showing his pipes and his sweet Muppet ink. Chewie found a new friend on our crescent and spent most of the weekend riding bikes up and down the block and playing with his new buddy - so it was lucky that he stayed still long enough for me to snap this picture of him on the swing. My goofy boy - i love you. And your sweet summer buzz cut. It's crazy to me that the boys have less than 6 weeks of school left. Where did this year go? Summers are so short here that it seems you wait so long for them to arrive to have them flash before you in the blink of an eye. Weekly Challenge #268: "A bit-o-black"
Thanks, Donald, for pointing out that my numbering was off last week. LOL. We should be back on track now. This week's Challenge is to add a bit of black. Just add a bit more black to your tangles in a way you wouldn't normally do. You may find that when you add a bit of black it adds a bit more drama to your tile and makes it more dynamic! For my tile i just used a simple "X" string, and used 4 tangles that are my go-tos. From the top clockwise they are: Ennies, Shattuck, Hollibaugh, and Tripoli. Tripoli - i like to draw circles inside my triangles - but usually i fill them in with black and leave the spaces white - so i switched it up and filled in the spaces and left the circles white. It should be really interesting to see where you all add your black bits - to see how that changes the tangles and gives them more OOMPH!! Have a great week, everyone. Have fun with this one! Glad you had a wonderful birthday. What would we do without our friends? I like the idea of altering where the black might go in a tile or in the tangles. Looking forward to playing with this. Yours is fun! Adding black is a really good idea ! Love this challenge Laura, Your tile is very lovely ! I like infinite places and I'm glad you had a wonderful birthday and some quality time with your friends! Wow! You have some awesome friends. Happy belated birthday! I loved hearing about your birthday surprise! So glad your friends were able to coordinate and pull it off! Thanks for another cool challenge. Fun! Wow, what a great gift from B-rad and those friends!!!! You are indeed blessed. And the last Wow is for your tile and the challenge; I love it. What a gorgeous art exhibit - and a wonderful birthday surprise! How lovely! What a great art exhibit! Thank´s for charing! Ad a wonderful theme for the challenge! I bet I´ll go for it more this week! Laura, I'm glad you had a great birthday after the struggles of the last few weeks. You've got great friends around you, as you are a great friend to them, I'm sure. This was a great challenge and I ended up having 3 tiles completed. I have to admit that one of them I'd just completed the day before. :-D You inspire us all with the challenge and what you do with that challenge yourself. What a fun birthday surprise - Happy Belated Birthday. I don't like using black... so this was a good challenge for me. Thanks Laura! Happy belated Birthday Laura! Sounds like a really fun day. Belated Happy Birthday! It seems like it was a wonderful surprise. 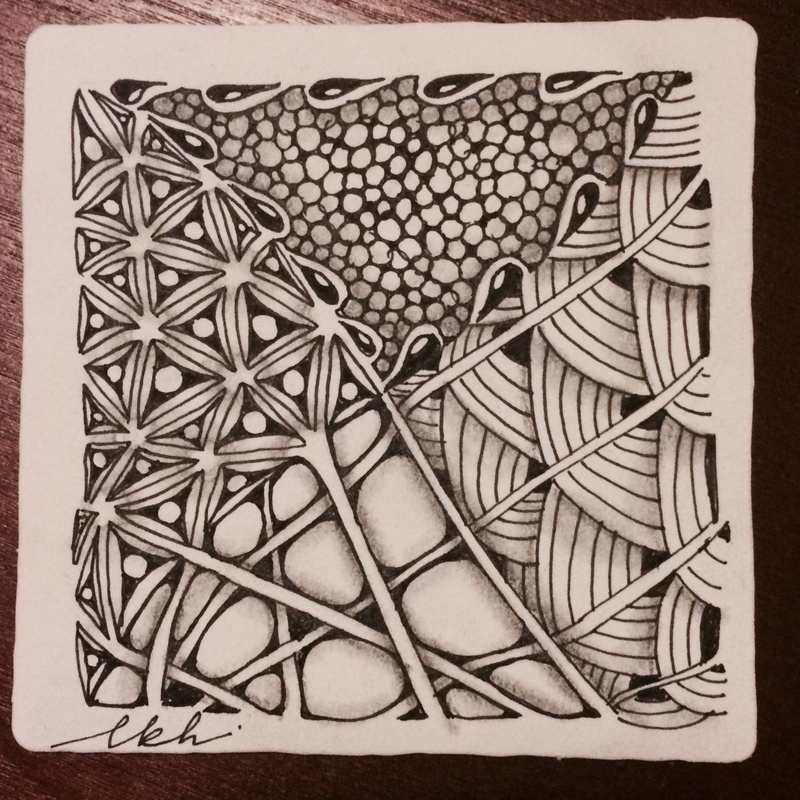 I really enjoyed this challenge; as it allowed me to finish the tile I started for the Globular Grid challenge. I couldn't figure out how to end it; but adding that bit-o-black was the perfect solution. Happy Belated Birthday! What wonderful friends and hubby you have. It sounds like you had a great time! Thanks a lot for the great Challenge! Happy Sunday! Happy Belated Birthday and thank you for the challenge! 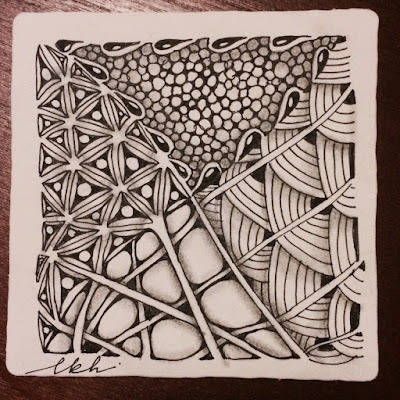 I'm new to Zentangle, after looking at books and pens at the local art supply store for months and months. I'm so excited to have found your community - and some others and find the practice relaxing and meditative. Thanks for being here! And thanks for the challenge!